From the good amount of time trying out the game with Nick, I can totally see Super Mario 3D World as the true upgrade to the New Super Mario Bros. series. Don’t get me wrong, 2D Mario titles are usually fantastic, but the same-old formula is now changed for the better here and it should stay this way going forward. For one, I’m not held back by that same 2D side-scrolling action I’ve grown accustomed to, freeing myself up for lots more exploration and freedom. At the same time, I’m familiar with how to proceed throughout the stages and feel like I have a bit of breathing room to connect with the game better. Once again, we could choose to play as either: Mario, Luigi, or Toad, with the new addition of Peach, but with only one character allowed to be played at the same time. Like in Super Mario Bros. 2, each character has their own set of abilities that differ between each other that mix the team dynamics up slightly. Mario is still the most balanced of the bunch, with Luigi being able to jump the highest out of everyone. Peach once again receives her ability to float in mid air for a short time, while Toad remains the fastest of the four (however, he receives no boost in strength). Various co-op moves are still present in this game, such as a super ground pound attack, and are activated when all players do the move together at the same exact time. However, we found the ability to pick up, carry, and throw players was rarely needed to progress, and was mostly used for trolling. Since this side-scroller is played in 3D, many of the problems that plagued co-op mode in the New Super Mario Bros. games rarely happen here. For example, I was constantly jumping on other player’s heads by accident in those games, more than likely killing them. This was never really an issue in this game, because I at least could move in more than just a few directions on the screen. Luigi and Peach are also able to bypass certain gaps that Mario and Toad cannot hope to jump over, which helps to keep small pathways around pitfalls less congested. Along with ability to turn into a bubble to avoid danger and catch up to everyone, the game retains its beginner-friendly features (but can be left alone if challenge is desired). Moving around the stages in full-body Catsuits was certainly the highlight of the play through. 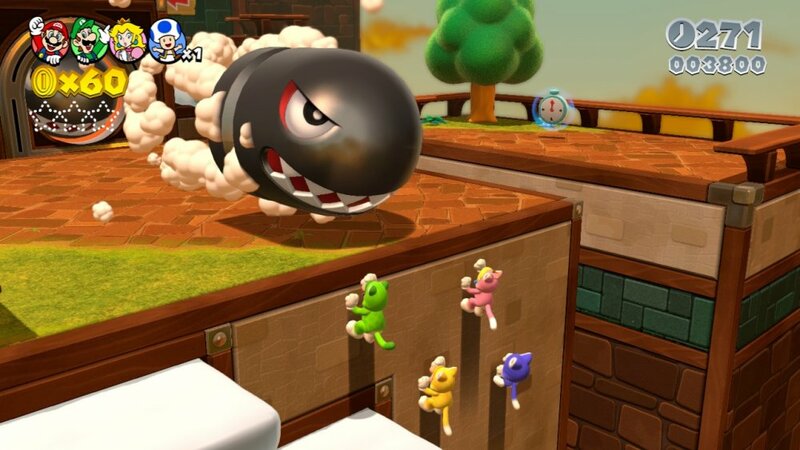 I couldn’t get enough of scampering up walls, pouncing down on enemies from above, or hearing the Mario cast “meow” at every chance they could. 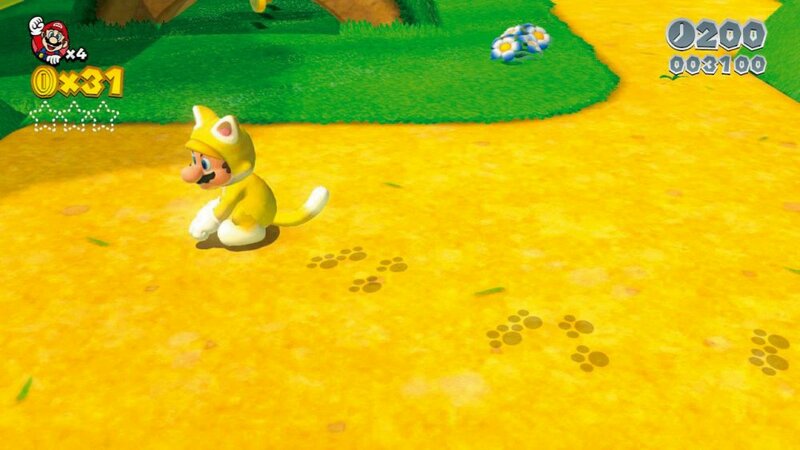 Sure, there were other powerups to be had, like the Fireflower (Fire Peach is finally a reality) and the Racoon Suit, but the Catsuit’s new agility feats bring back the same feeling of playing Super Mario 64 for the first time. Moving through clear warp pipes is also a great addition for puzzle solving, item collecting, and strategic options. In short: Super Mario 3D World is exactly what the Mario franchise needs to stick with its classic platforming roots on the television, but keep up in the modern, online era of gaming. The transition from its prequel, Super Mario 3D Land on the 3DS, is done superbly and we can truly dig the co-op mode provided thus far. We expect this one to top New Super Mario Bros.U’s opening sales easily this holiday season (releases on November 29th).